The cheapest flights from Mexico to Brazil are with Calafia Airlines. However, I can't understand what countries it flies through. From Mexico to Brazil directly? Or via the USA? In Wikipedia, CSL airport is in Mexico. But on the Kiwi map, it shows that flights go via the middle of California, USA. And besides, there's one additional stop although I'm looking for flights from Mexico to Brazil. That implies that that stop is outside of Mexico. But again, CSL is in Mexico. This appears to be an error, and this itinerary doesn't make any sense. Calafia Airlines does not fly to California or to Brazil (or anywhere outside of Mexico), and one of the flight numbers that come up on kiwi.com, A7 251, doesn't seem to match with any real flights. There's no way it takes 22 hours to fly from California or Mexico to Brazil, as the itinerary suggests A7 251 takes. The normal San Luis Obispo airport does not have any international flights, and "Camp San Luis Obispo" does not exist anymore as an airport (it was once an old Army facility), but kiwi.com seems to be confused about the small Cabo San Lucas airport CSL. The first flight does make logical sense. 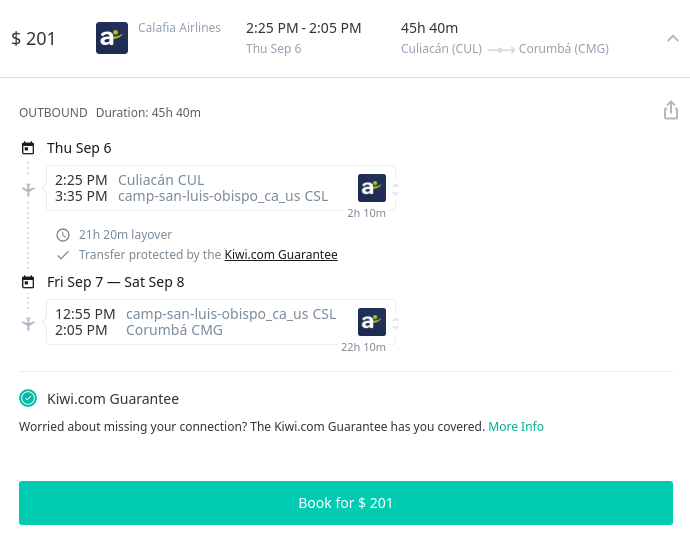 Calafia's website will sell you a flight 126 from CUL to CSL (the small airport at Cabo San Lucas with the IATA code CSL) that leaves at 2:25pm. But there's no flight 251 from there to CMG. Since Calafia doesn't fly anywhere in Brazil, let alone a place as difficult to reach as Corumbá, that's not going to work. I can't figure out exactly what set of data errors have led kiwi.com to come up with this itinerary, but I can't see how buying this ticket would result in a useful trip going anywhere, and I would try another search. Not the answer you're looking for? Browse other questions tagged usa airports mexico flight-search-engines brazil or ask your own question. What documents does a US citizen need to visit Mexico?